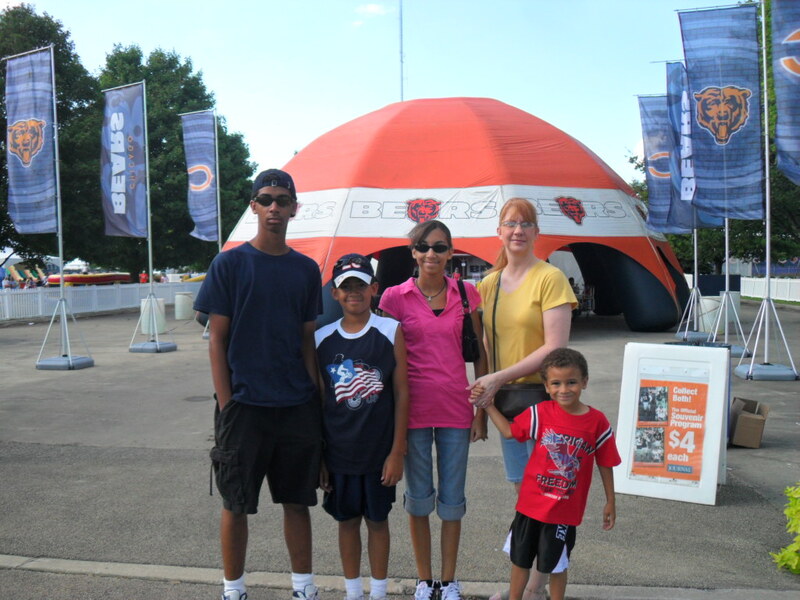 My family went to the Staples Bears Training Camp presented by Chase on the campus of Olivet Nazarene University in Bourbonnais, Illinois, and we had a lot of fun. This is the 9th consecutive year of them being at Olivet Nazarene. This training camp is open to the public, and there’s free admission and free parking, it’s a great time for the family, especially Bears fans. 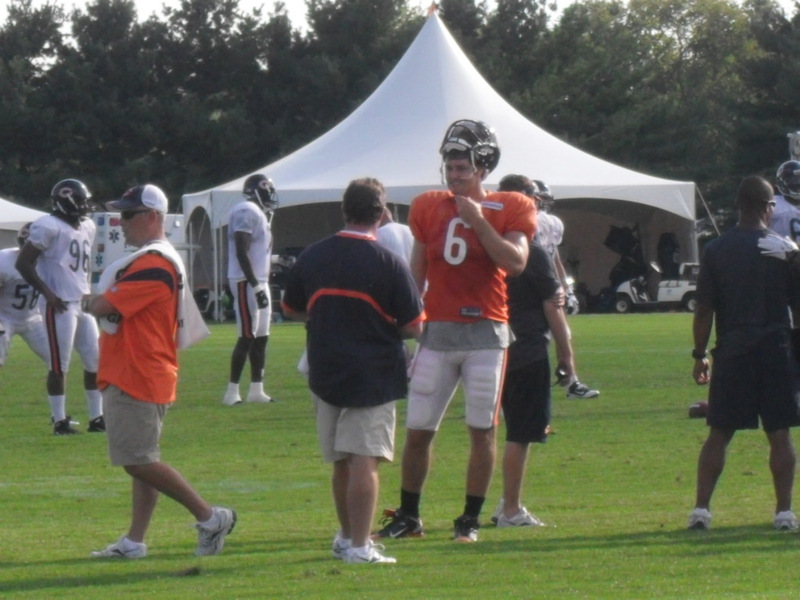 The training camp started on July 30, and ends today, August 19, 2010. There are three different practice times, Noon, 3 p.m., and 7 p.m. The gates open one hour prior to start of practice and close one hour after. It’s a lot of fun to watch them practice, and you get a chance to see your favorite players. There are several Theme days, where they have extra activities going on throughout the camp ground. There is the Staples Kids Only Autographs on select days. Where the first 150 kids ages 4-12, in line will receive a pass for the autograph session for that day. Kids are allowed one autograph per person, but they are not able to take pictures with the players. There is also the Staples Bears Pride Poster Contest on select days as well. Kids ages 4-12 can make a poster, and are entered into a random drawing. The winners receive a pass to enter Staples “Front Row Kid Zone” along the players exit from the field. There were several booths and tables with free things available. We each received a Bic marker and a folder for autographs. There were free roster posters with pictures of different players. Staples had a booth and were giving away free Bic markers in all kinds of colors. I was excited about the free markers!! Staples also had a Back to School day, the day before we went and they were giving away free Bears/Staples brand backpacks to the first 500 kids. I didn’t know about it until after we went. The website didn’t list that as one of the theme days until probably the day before. 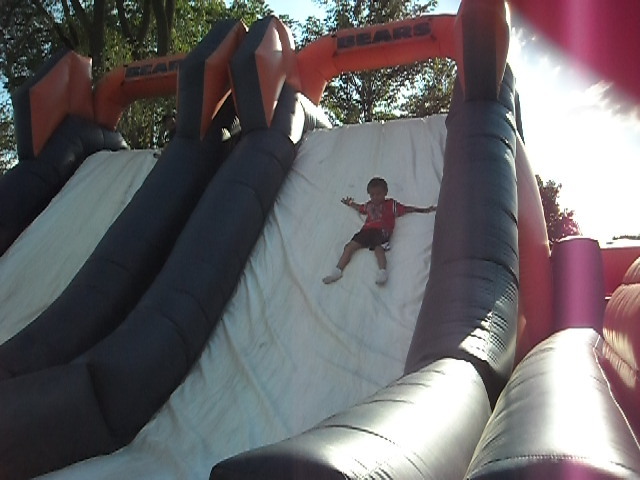 Jewel-Osco sponsers the Inflatable Kid Zone where they have this huge obstacle course shown here with Benji sliding down. They have other inflatable things as well as a basketball toss and football toss. Benji and Elijah really enjoyed this. We were there at a good time, since there weren’t a lot of kids waiting in line. Throughout the camp grounds there are concession stands to purchase food, and they also have hydration stations for fans to access free water and Gatorade. There is also a Pro Shop that has everything Bears to purchase, hats, mugs, footballs, jerseys. We were there the second to the last day, and they were selling the Training Camp T-shirts for $10, which had originally been $25. There’s just enough things to see and participate in. The day we went was very pleasant, the sun was warm, but there were some areas of shade to cool off. Of course Elijah thought it was the “best day EVER.” It is a lot of fun, especially for the younger kids. For anyone in the southern suburbs, its a pleasant drive to Bourbonnais. I look forward to going again next year. 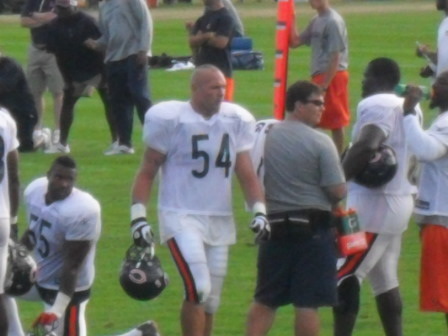 This entry was posted in Family, Life and tagged autographs, back to school day, Bears practice, Bears pride poster contest, Bourbonnais IL, Brian Urlacher, Chase, Chicago Bears, Chicago Bears Training Camp, Jay Cutler, Jewel-Osco, Kid Zone, Kids 4-12, Olivet Nazarene University, Staples. Bookmark the permalink.